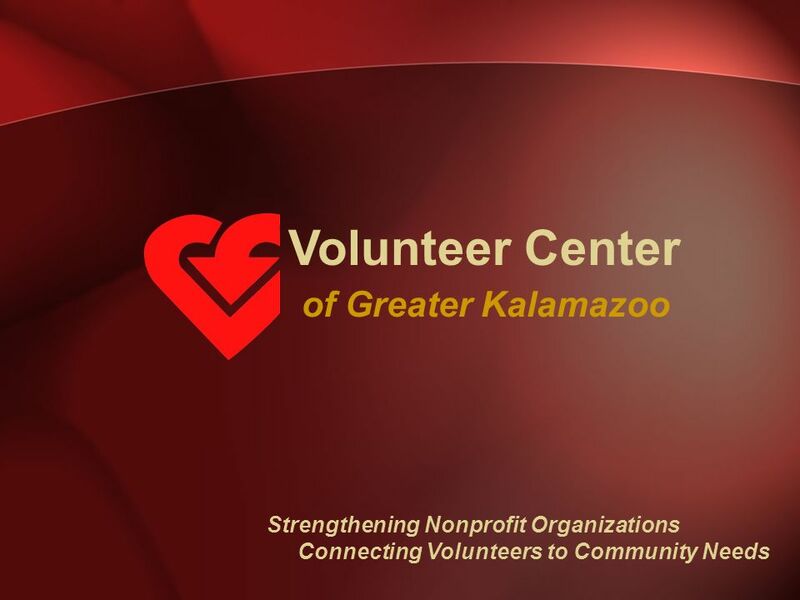 Volunteer Center of Greater Kalamazoo Strengthening Nonprofit Organizations Connecting Volunteers to Community Needs. 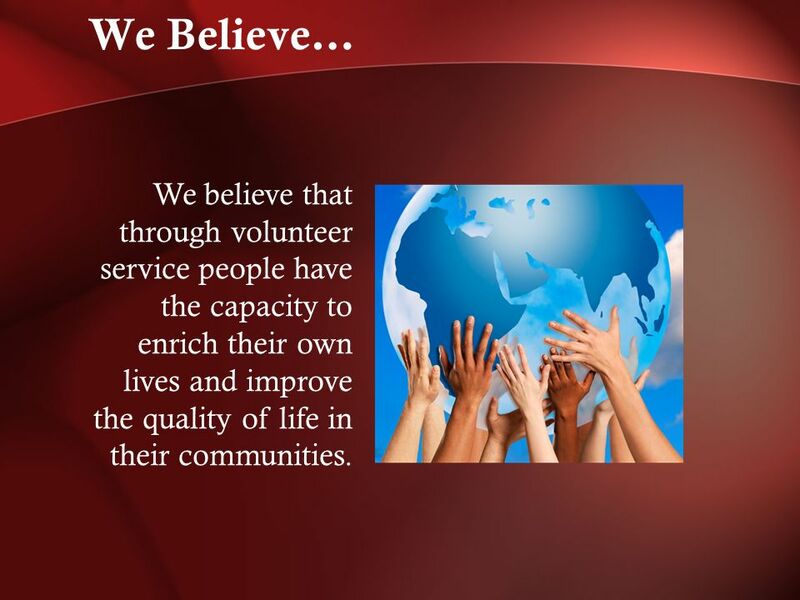 2 We Believe… We believe that through volunteer service people have the capacity to enrich their own lives and improve the quality of life in their communities. 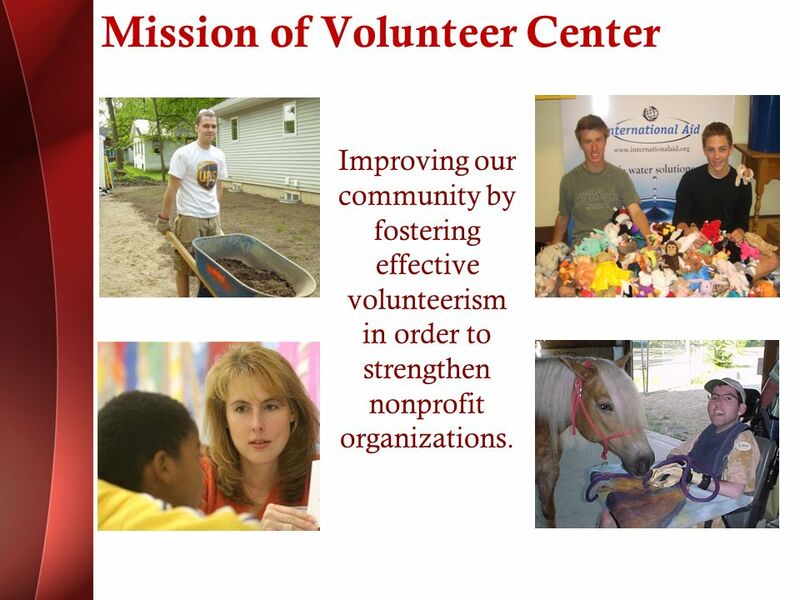 3 Mission of Volunteer Center Improving our community by fostering effective volunteerism in order to strengthen nonprofit organizations. 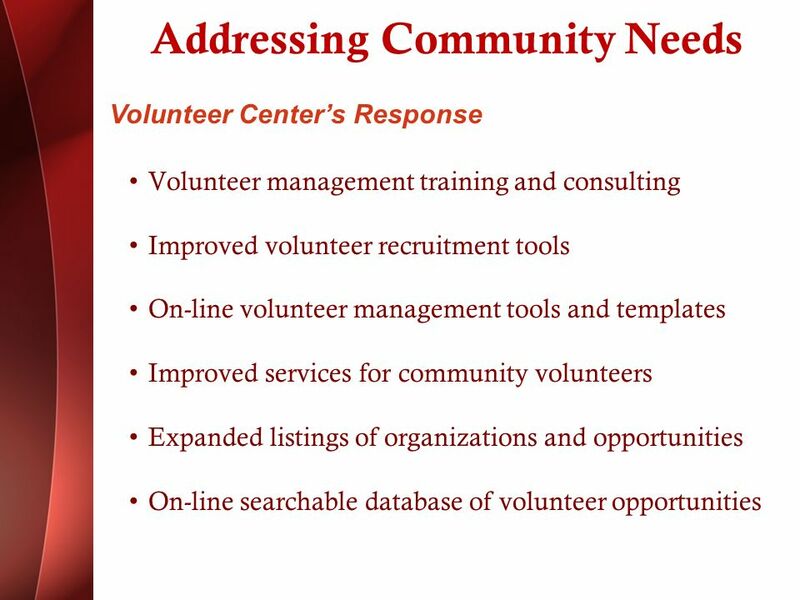 7 Role of the Volunteer Center Help develop skills, knowledge and programs for nonprofit volunteer coordinators to improve retention of volunteers. 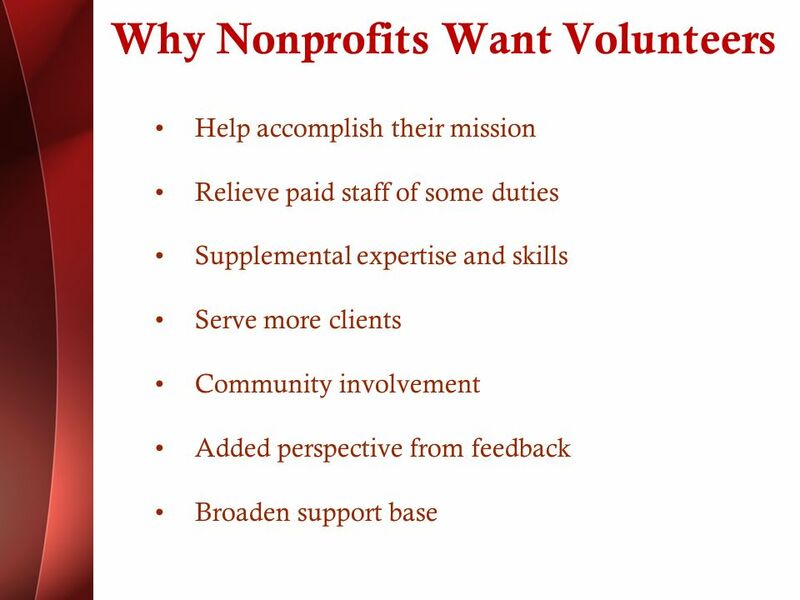 Help build local capacity of nonprofit organizations by recruiting volunteers. 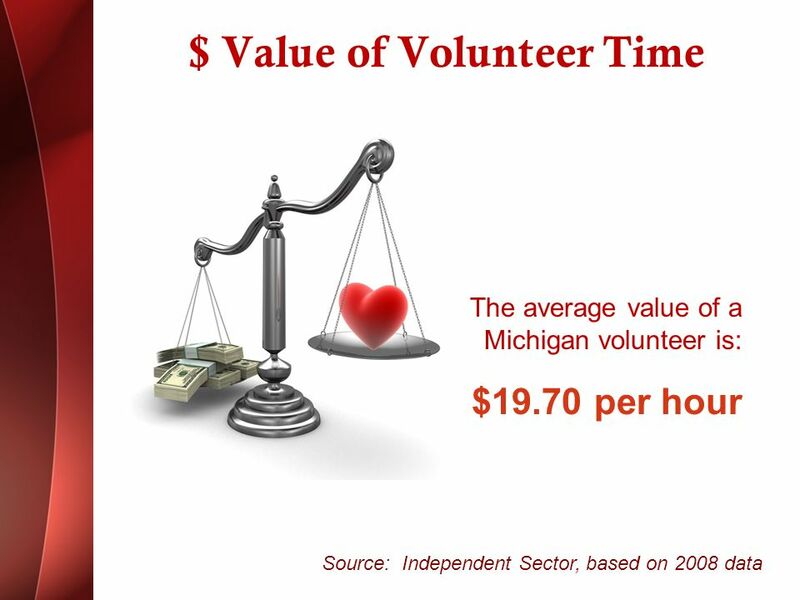 Help raise public awareness of the need for volunteers. 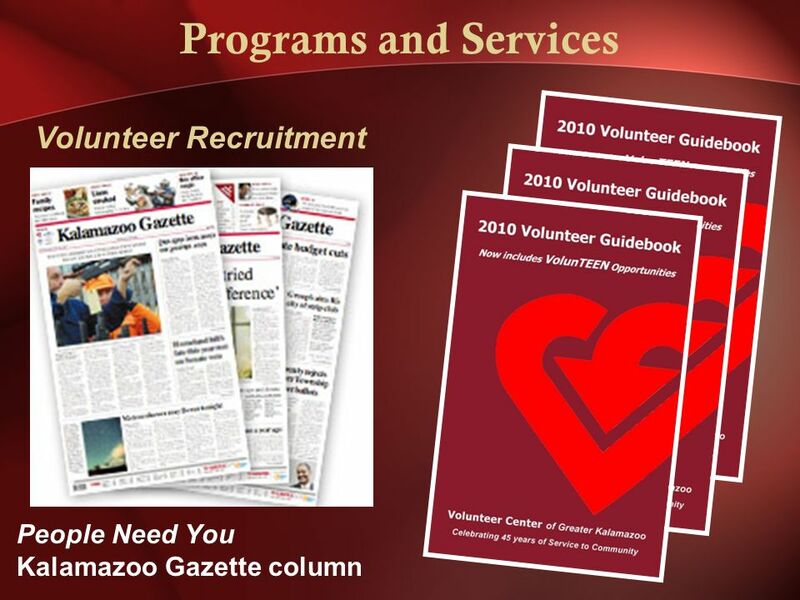 Help recruit board members to provide organizational governance. 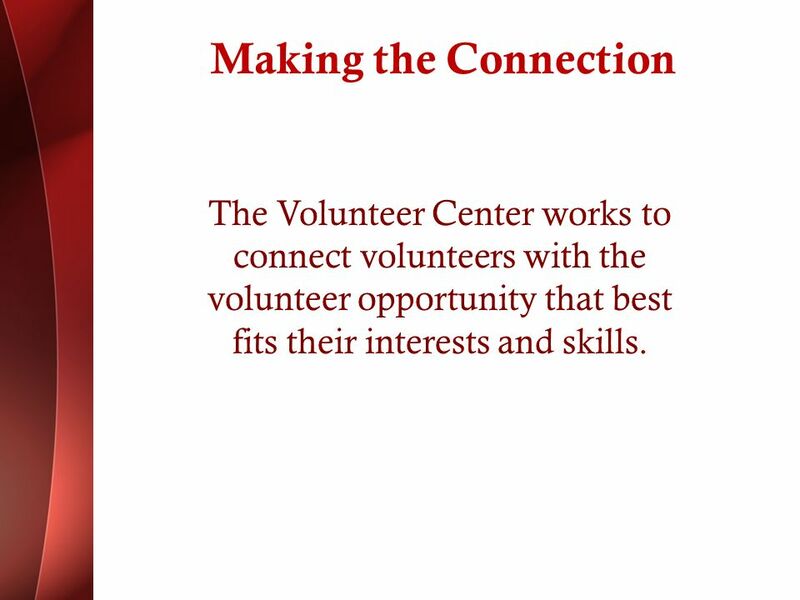 11 Making the Connection The Volunteer Center works to connect volunteers with the volunteer opportunity that best fits their interests and skills. 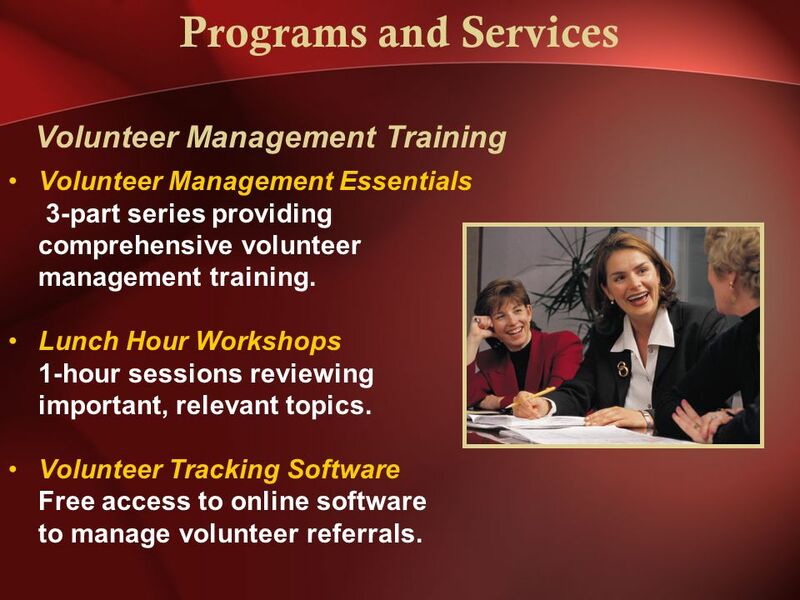 17 Programs and Services BoardConnect ® A nonprofit board training and matching service that builds the leadership skills of nonprofit organizations and community members. 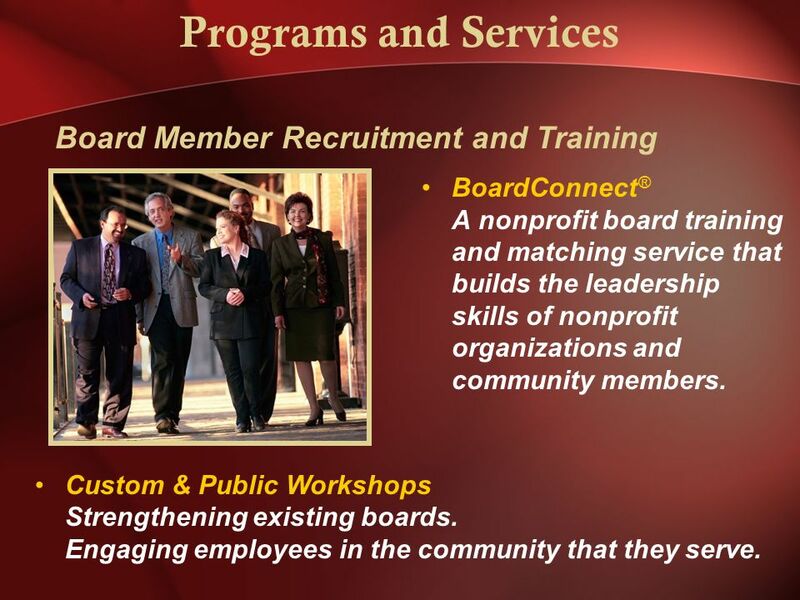 Board Member Recruitment and Training Custom & Public Workshops Strengthening existing boards. 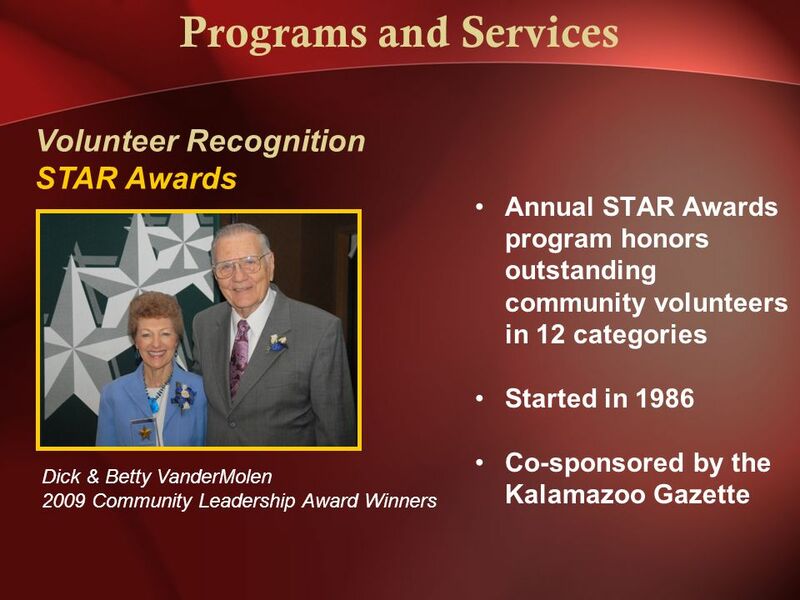 Engaging employees in the community that they serve. 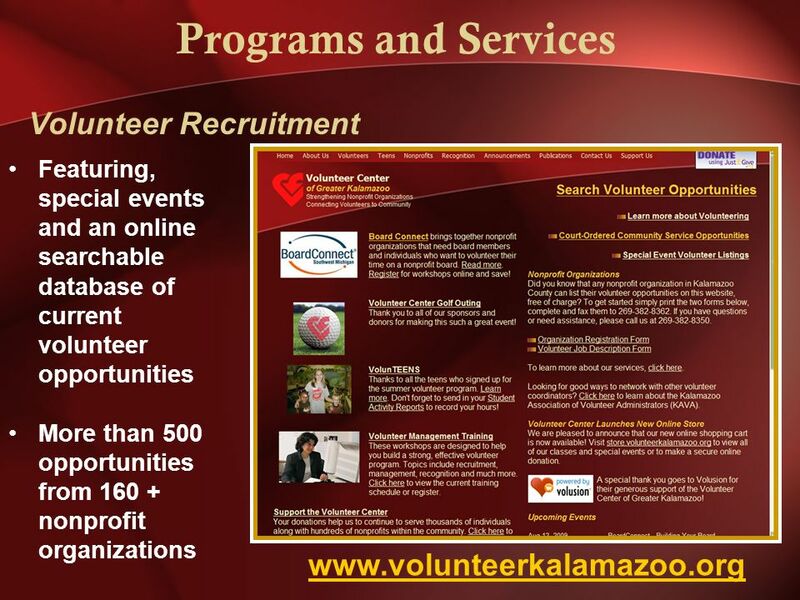 Download ppt "Volunteer Center of Greater Kalamazoo Strengthening Nonprofit Organizations Connecting Volunteers to Community Needs." June 18-19, 2009 | Hyatt Regency Chicago Sponsored by. 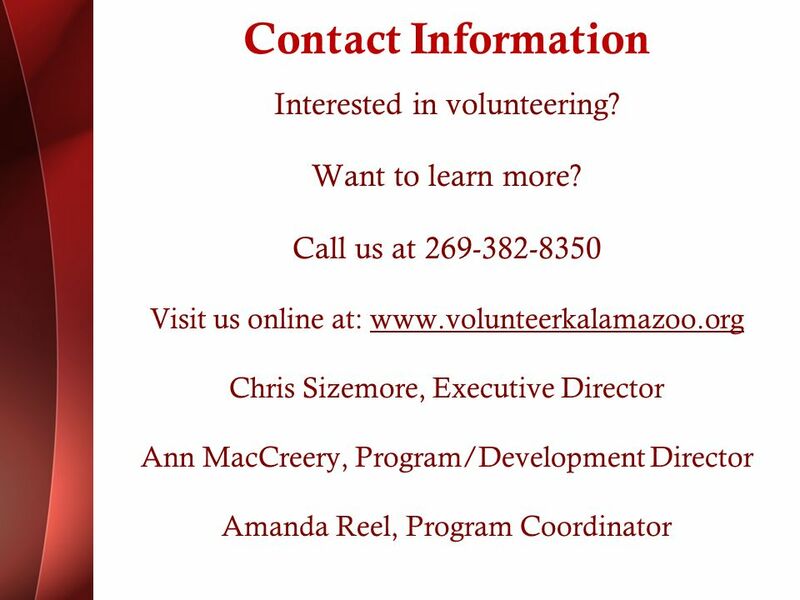 Training/Technical Assistance RFP information. American Recovery and Reinvestment Act grant U.S. Department of Health & Human Services (HHS) Administration. 2013 Capacity Building Grant Program Opportunities October 3, 2012. The Reading Counts! program provides students with practice that develops essential fluency, vocabulary, reading comprehension, and test-taking skills. Tidewater Community College Division of Workforce Development Suffolk, VA Academy for Nonprofit Excellence NCWE Conference October 2013 Lillian BaileyLisa. VOLUNTEER MANAGEMENT INTERNAL KICKOFF DATE The Leadership Development and Strategic HR Practice Area is presented by American Express. 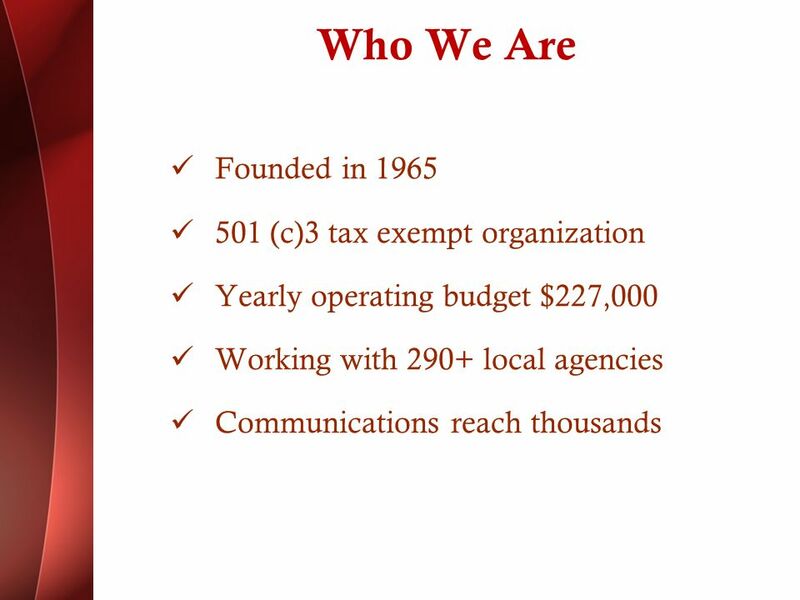 This Service Grant. 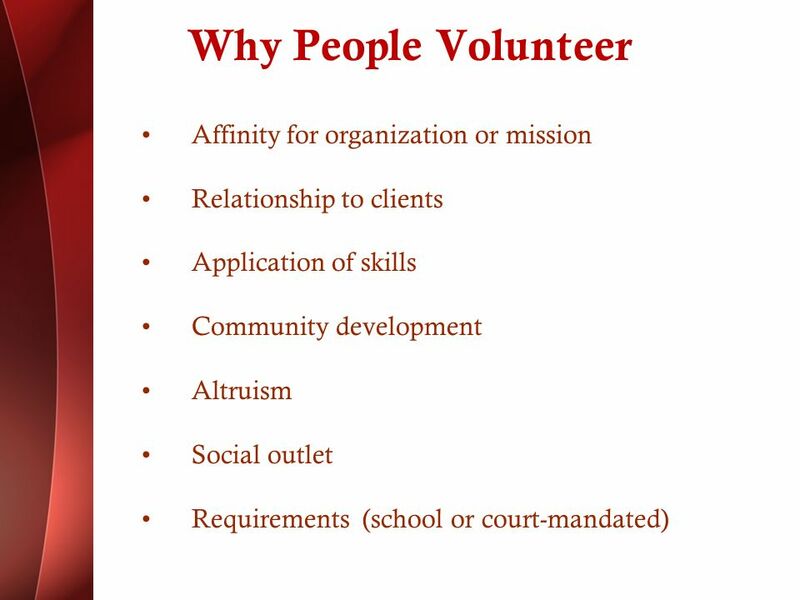 Our passion is PEOPLE We inspire & build leadership in the voluntary sector. Cultivating the Next Generation of Philanthropists. Building Organizational Capacity: The Signature Event AFP Annual Conference-Rhode Island Chapter April 27, 2012. Learn and Serve Higher Education Grant. What is the purpose of Learn and Serve America? 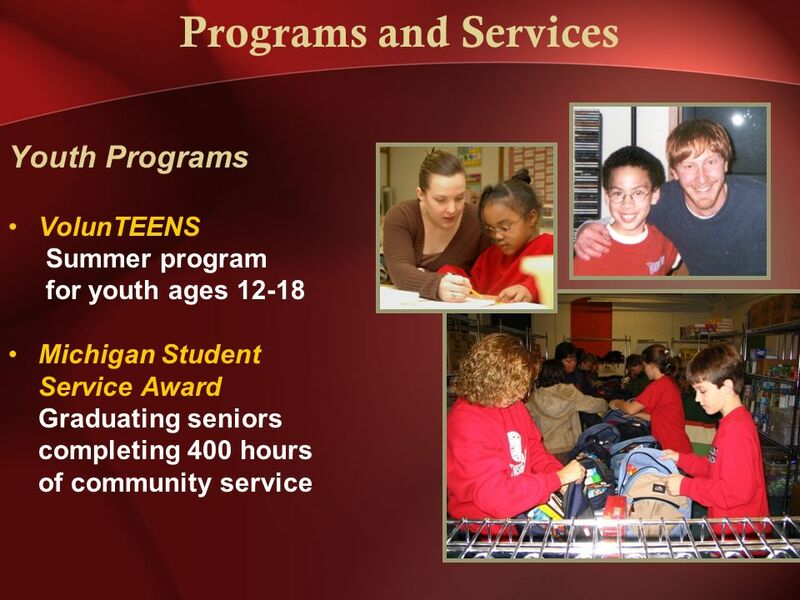 Learn and Serve America supports service- learning programs in. Planning for Progress Judith Lindenau, CAE, RCE www.judithlindenau.com.